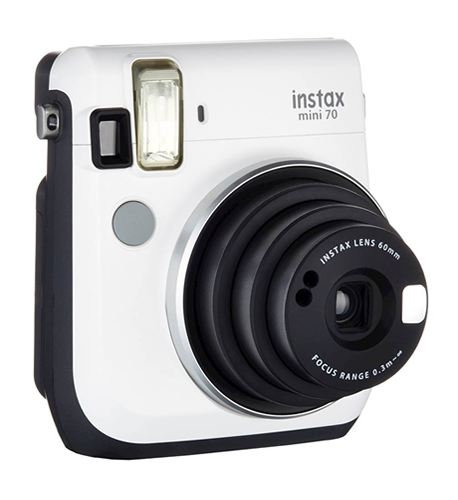 Designed for the selfie enthusiast, the canary yellow instax mini 70 is a sleek camera characterized by a range of features for self-portraiture and sharing your instant credit card-sized prints. The camera's design incorporates a retractable two-element Fujinon 60mm f/12.7 lens that permits focusing as closely as 11.8" in macro mode. The optical real image viewfinder has a 0.37x magnification along with a target spot to aid with composition, and the front of the lens incorporates a small mirror to also benefit more accurate selfie compositions. Besides the standard automatic exposure control, with +/- 2/3 EV exposure compensation, the built-in flash can be used in conjunction with an automated exposure mode to adjust shutter speeds for enhanced background detail. A dedicated Selfie shooting mode also automatically adjusts brightness and accounts for the close-up shooting distance of self-portraits and a creative Hi-Key mode brightens the overall exposure for cleaner-looking skin tones. 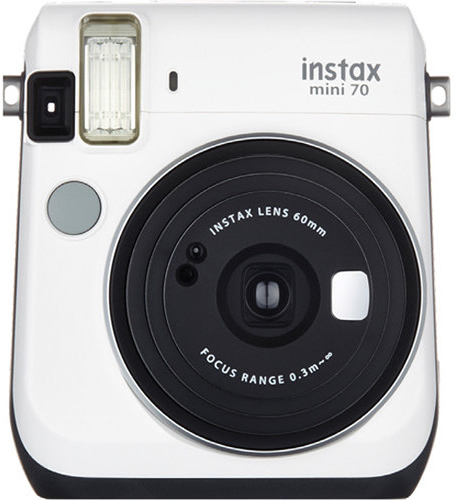 For self-portraits taken at longer than an arm's length, the instax mini 70 also features a tripod mount and a 10 second self-timer. Additionally, for sharing a print with someone, the 2 continuous photo self-timer mode will automatically shoot two frames within the self-timer's duration to provide you a pair of similar prints.